Benedict XVI who was the pope from 2005-2013, celebrated his 90th birthday yesterday in his home, a monastery on Vatican City grounds. Guests came from far and wide to join him including his brother, Monsignor Georg Ratzinger and the Bavarian Prime Minister. 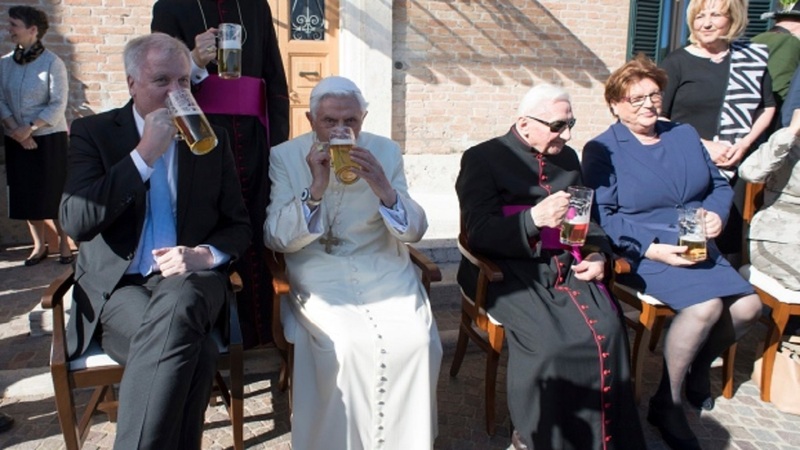 Benedict XVI was born in Bavaria on April 16, 1927, but his birthday was postponed to Easter Monday, so it would not detract from Easter Sunday festivities. Pope Emeritus Benedict XVI was the first pope to retire in more than 600 years and did so because he felt he lacked “strength of mind and body” due to his advanced age. It’s good to know that even at 90 there’s nothing like enjoying a nice beer with friends. JustBeer is giving away tickets to the Calgary International Beerfest on May 4 & 5, 2018. Want to win? Follow these steps to be eligible for a chance to WIN YOUR WAY IN. Contest Closes May 1, 2018. Celebrating the launch of Canoe Brewpub’s new beer line-up & brand new labels, get decked out in all the gear.